I've got a "third eye" type bike mirror attached to my helmet. It has two points of articulation: one near where it mounts to the helmet, which controls how far it swings up, and the other near the mirror which adjusts the mirror angle. When I first got it, there was some resistance to adjusting it either way, so once it was adjusted it just stayed in place. However, over time this resistance has decreased, to the point where the movement of air past me down a steep hill, or turning my head suddenly causes the mirror to move or the whole thing to swing out away from me. In either case the result is I suddenly cannot see behind me until I have time to safely move my hand up to adjust it back into place. As it usually happens at a time when it is not safe for me to do this, my ability to use the third eye goes away at times when I might need it most. I have tried using hot glue to fix both ends in place, and this works for a while, but over time it keeps working its way loose, especially the side closest to the helmet. 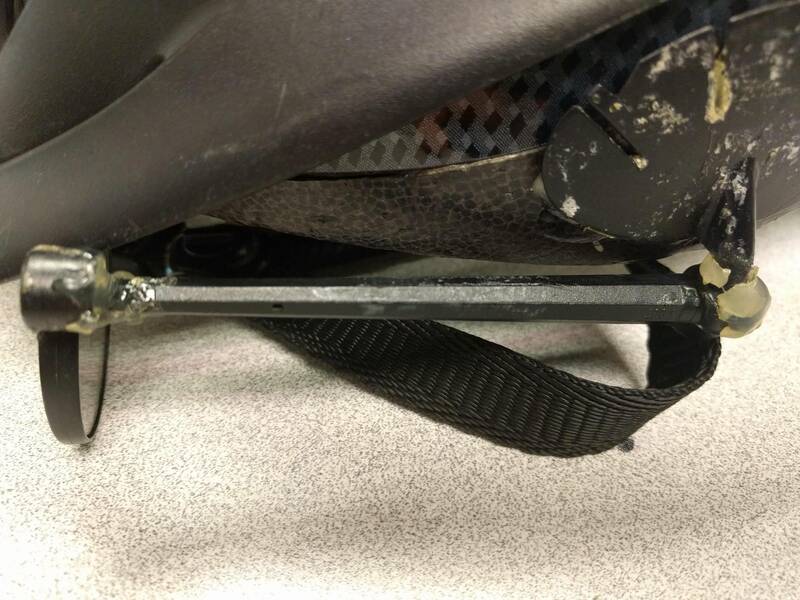 At the same time, hot glue is not particularly flexible, so if I don't get it adjusted just right I wind up on my bike having to turn my head one way or another to hit the sweet spot where I can see directly behind me. What it seems like would be useful is if there was some kind of fluid that I could run over the contact points which would increase the amount of friction enough that either end would stay put when I'm not trying to adjust it, but not enough to prevent me from adjusting it whenever I need to. Kind of like the opposite of oil, and ideally something nothing sticky to the point of attracting too much dust and grime or otherwise making a mess of my hands whenever I try to adjust the mirror, yet long lasting enough that I don't have to apply it more than maybe every month or to. Does something like this exist? Or is there some other solution that can be recommended? Chewing gum, or putty. You do not need to put the friction-increasing substance inside the joints - you can put it outside. Easier to remove later. You can also wrap sticky tape around the joints (if it's not supposed to move, but does, use duct tape; if it's supposed to move, but doesn't, use WD40 :) ). I've managed to make the joints on a headtorch (that I use on the bike sometimes) much stiffer by wedging a rubber band in the hinge. If you can disassemble it, a bit of inner tube might do the trick, or a smear of hot glue. But if the joint can't be disassmebled it's much harder. There may still be a possiblity of wrapping a rubber band (or slice of inner tube) over the joint many times until it's tight. A trick I've used in a very different situation (to make a sort of poor-man's self-locking bolt) is to put a fairly viscous but not too permanent threadlocker in there. When it's dried, deliberately break the threadlocker free. It will stil increase friction dramatically. Not the answer you're looking for? Browse other questions tagged safety mirrors or ask your own question. How safe are helmet- or glasses-mounted mirrors?